We were fortunate enough to be invited to cover The French Culinary Institute in New Yorks first-annual  New York Culinary Experience  and found the experience to be extraordinary. 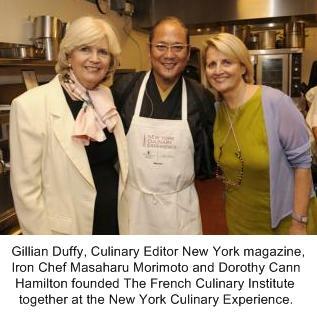 Put on by The French Culinary Institute and New York magazine the event was a pure culinary joy for professionals and armatures alike. The event is designed to allow for a once-in-a-lifetime opportunity to cook right alongside some of the worlds hottest and most influential chefs! Class sizes are limited to 25 to allow for these hands-on master classes to be as intimate and informative as possible. The size also allowed for unique personal exchanges with the chefs. Where in the world can you work, learn, cook and eat along side Iron Chef, Morimoto or bake with the King of Cakes, Ben Israel? Where can you learn the techniques used in chocolate with the likes of Mr. Chocolate, Jacques Torres or learn about what it takes to be an ultra successful restaurant operator like Donatella Arpaia? If you guessed the New York Culinary Experience, youre right! Whats more it may be the only place you can! Add in more world class chefs such as Marcus Samuelsson of Aquavit and Merkato 55; Eric Ripert of Le Bernardin; Terrance Brennan of Artisanal and Picholine; Anito Lo of Annisa; Karen DeMasco of Craft; Johnny Iuzinni of Jean Georges; and you see why attending makes sense. Finally, you have the opportunity to learn from leading industry experts like Danny Meyer and Drew Nieporent. Our culinary food challenge was deciding which sessions to attend. This is sure to be one of the top 10 culinary events of the year each and every year so make your plans and reservations early, as it will surely fill up quickly. Do yourself and your career a favor, dont miss the next New York Culinary Experience. Hope to see you there!